In Film 400 we were asked to do a character portrait. It could have been someone you knew or a fictionalized person, but the basic idea was to just focus on that individual and give a glimpse into some aspect of their life. I decided to make mine about my friend Jeanette who was a geology major, and whose specific terminology of rocks and minerals I often got a kick out of poking fun at. I took a bit of liberty in editing her answers just the way I wanted (not sure it's obvious, haha), but it was all practise anyway for the mockumentary project Elliot that served as my final film for that term. 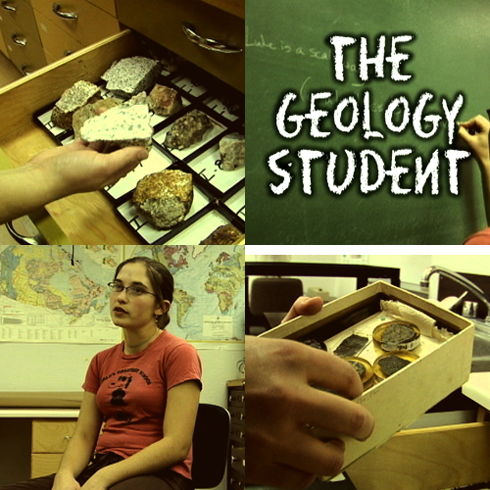 You won't find any hard hitting facts in The Geology Student as I tour the geology department with Jeanette, but needless to say, there were quite a few laughs. Enjoy!